Aloo Gosht recipe by hotline_hl at DesiRecipes.com. 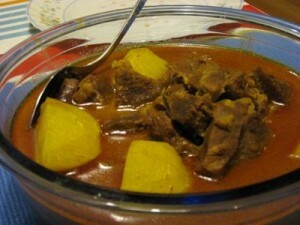 Mutton cooked over medium heat with spices and simmered with potatoes. Put the meat and one cup water in a deep saucepan. Now add the onions, ginger , garlic salt , red chili, haldi and let it cook for about 25 minutes. When the water starts to dry up, add the oil and fry for another 5 minutes. Now add the tomatoes and potatoes and keep on stirring while cooking. When the meat potatoes and meat start sticking to the sauce pan, add about one glass of water, and cook on low heat. If the potatoes are cooked and the meat is tender, the aloo gosht is ready. Sprinkle the garam masala, and garnish with cilantro and cut green chilies. Good recipe but there is no mention of time cooked, level of heat and what and when to cover. It's rather a simple recipe that even an amateur can cook. Good job!